"[But] intelligent design is not science, it has no testable hypotheses, no proposed methodologies, no research data. It is derived from its own claims. Its philosophical arguments have been rejected by the science community." In evolution, as in all areas of science, our knowledge is incomplete. But the entire success of the scientific enterprise has depended on an insistence that these gaps be filled by natural explanations, logically derived from confirmable evidence. Because "intelligent design" theories are based on supernatural explanations, they can have nothing to do with science. The creationists' fondness for "gaps" in the fossil record is a metaphor for their love of gaps in knowledge generally. Gaps, by default, are filled by God. You don't know how the nerve impulse works? Good! You don't understand how memories are laid down in the brain? Excellent! Is photosynthesis a bafflingly complex process? Wonderful! Please don't go to work on the problem, just give up, and appeal to God. Dear scientist, don't work on your mysteries. Bring us your mysteries for we can use them. Don't squander precious ignorance by researching it away. Ignorance is God's gift to Kansas. 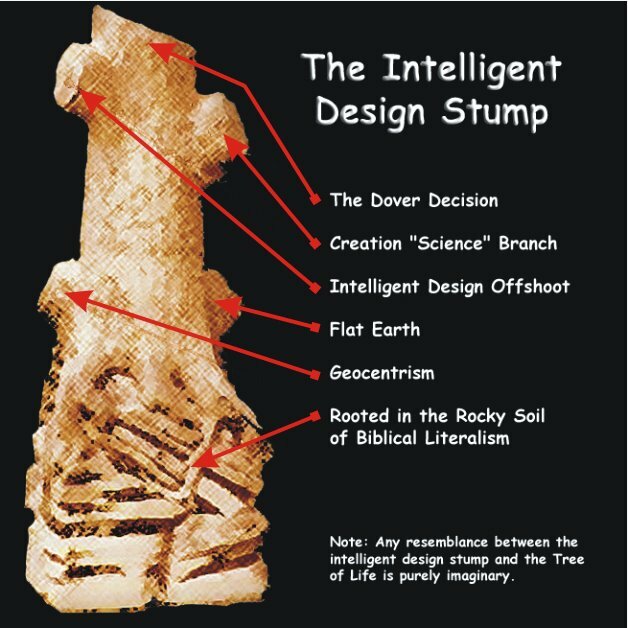 Intelligent design is nothing more than creationism dressed in a cheap tuxedo. Intelligent Design is lipstick on the pig of Creationism. Why would an omnipotent, omnipresent, all-knowing God create the human shin bone at the level of a tow bar? u-bend, it just won't go away. Kenneth R. Miller, Professor of Biology, Brown University, Providence, R.I.
God, the Universe and Evolution: A Conversation with a Creationist. Edward E. Max, M.D., Ph.D.
Humorous Testing of the Scientific Attitudes Toward "Intelligent Design" Via Scientists Named "Steve"
Who will be Steve #1000? "It was nip and tuck, but when the dust settled, Dr. Steve Darwin was named the 1000th Steve in NCSE's Project Steve." "As a threat to Darwinism, it's [the film Icons of Evolution] reminiscent of a woodpecker trying to bring down a sequoia." Intelligent Design ... Is It Science? A Critique of Phillip E. Johnson's "How Can We Tell Science From Religion?" "Barbara Forrest and Paul Gross recently have, in response to the anti-evolution program, produced a work, 'Creationism's Trojan Horse'... What Ms Forrest and Mr Gross describe as 'The Wedge' of the Dembski adventure is nothing less than a lavishly funded program to embargo a lot of books because they challenge the assertions in one book, the Bible. This is just silly." 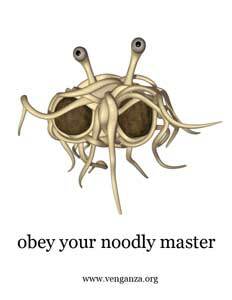 " ...what our scientist does not realize is that every time he makes a measurement, the Flying Spaghetti Monster is there changing the results with His Noodly Appendage." "Juliette Hughes examines the boundaries between religion and science"
""Intelligent Design' Foolishly Pits Evolution Against Faith"
"Religious arguments have permeated debates on the role of the law in medical practice at the beginning and the end of life. But nowhere has religion played so prominent a role as in the century-old quest to banish or marginalize the teaching of evolution in science classes." "If there's no God, who pops up the next Kleenex?" "It now seems unlikely that a theory will ever emerge which could completely replace Darwin's theory of evolution. But should that happen, scientists would be committed to investigating it fully. Intelligent design is emphatically not that theory, as it has systematically failed to stand up to any scrutiny. But, like a turd in the u-bend, it just won't go away." From Troy Britain's weblog "Playing Chess with Pigeons"
"The Discovery Institute has teamed up with the LA Family Forum, the Louisiana affiliate of Focus on the Family, to promote a stealth creationism bill in the guise of 'academic freedom' legislation." "It is sometimes hard to know whether books that strike one as silly and irresponsible, like Dissent over Descent, the latest book from Steve Fuller, are the product of a desire to strike a pose and appear outrageous (the John Gray syndrome), or really do represent that cancer of the contemporary intellect, post-modernism." "For years, 'intelligent design' (ID) proponents denied that ID is just a new label for creationism. However, it is now well-known that the first intelligent design 'textbook', Of Pandas and People , is just a revised version of a classic 'two-model' creationism vs. evolution book named Creation Biology ." "Over at Uncommen Descent they are taking advantage of the brouhaha over the New York Post's 'gunned-down chimp' cartoon (which many have taken as a racist slur against President Obama) to take their own pot-shots at evolution and in the process they have served up another example of the two faces of intelligent design."